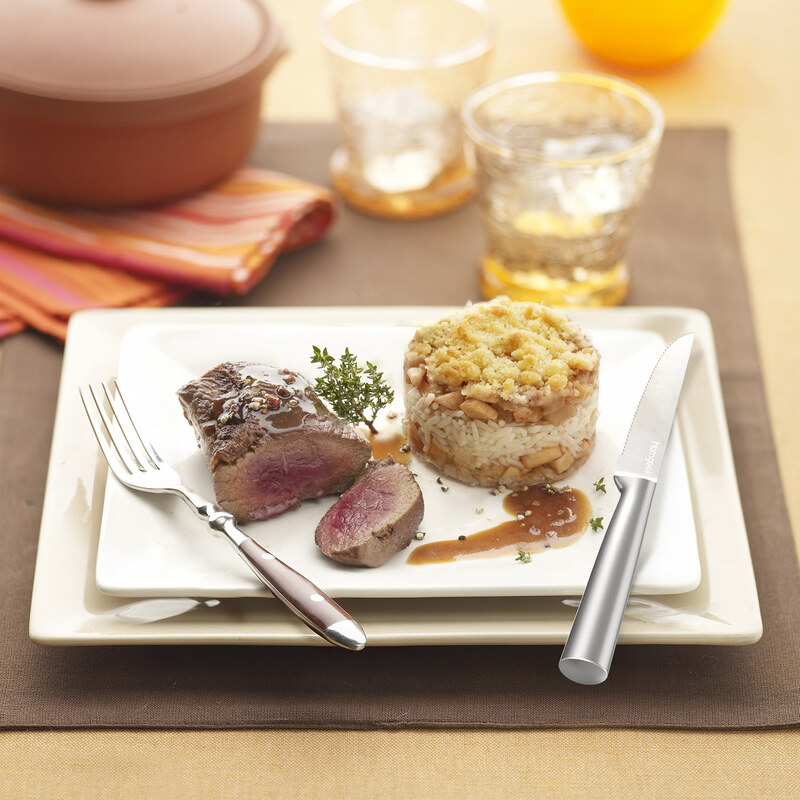 It is perfect serving tools for any occasion like party trays, dinner table. We are sure the guests will be impressed by such an enjoyable dinner with you. 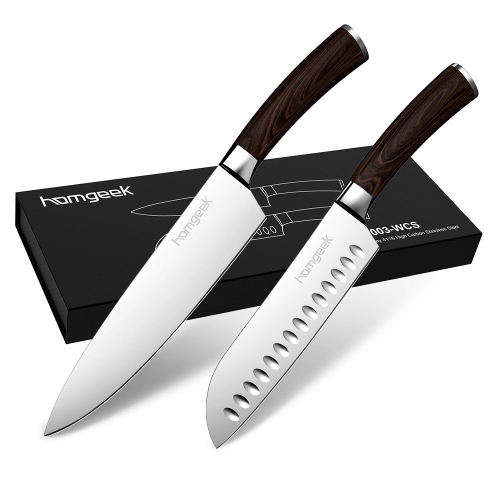 High Quality: The steak knife set is crafted from high-carbon stainless steel, measures 8.9" (23cm) long and requires minimal pressure to cut. 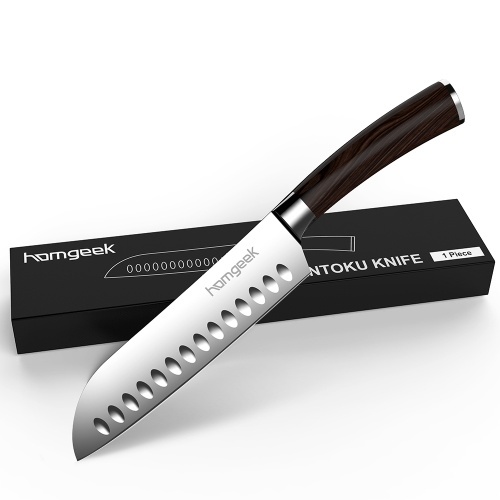 Each blade is forged for better strength and durability, hard enough to use for a long life. 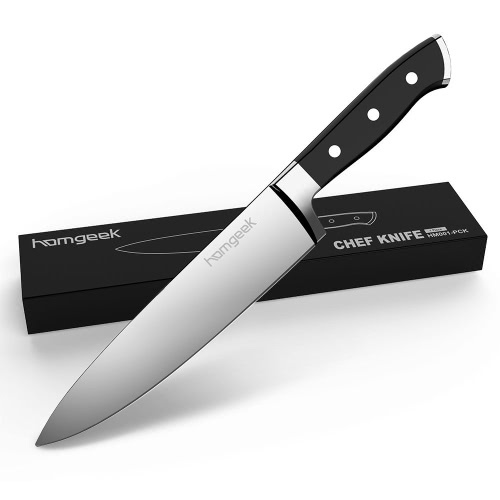 Serrated Edges for Maximum Performance: The knives offer micro-serrated edges that never need sharpening, and given a mirror-polished finish for lasting beauty. 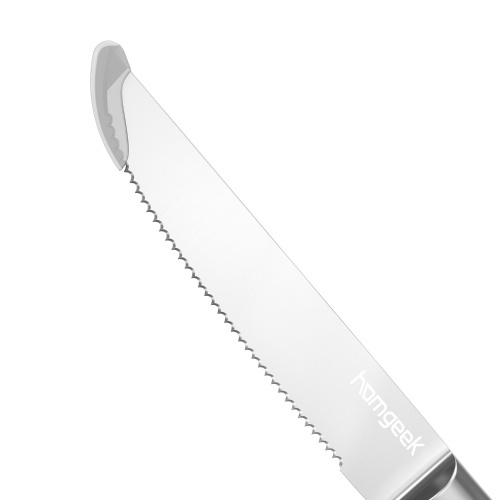 The serrated blade with an 18-degree slope makes it effortless to grab and cut with less pressure. 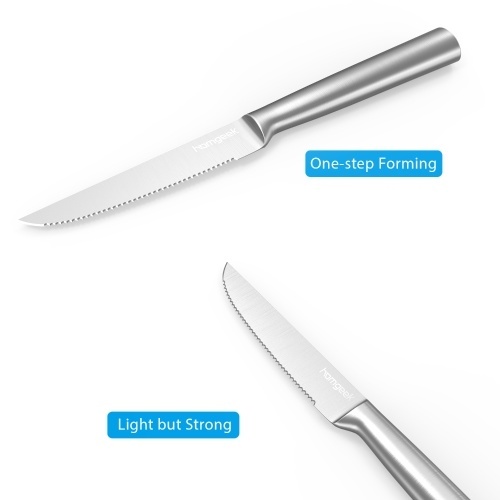 Plus, they will stay sharp much longer than any straight-edge blade. Ergonomic Design: The stainless steel steak knife designed with contoured handle design, easy to hold and comfortable for use. great for completing table settings at hotels, bistros, and catered events. Hand washing recommended: Easy to clean and maintain, hand-wash with warm water for best results, wipe it dry immediately, do not soak in water for long period of time. 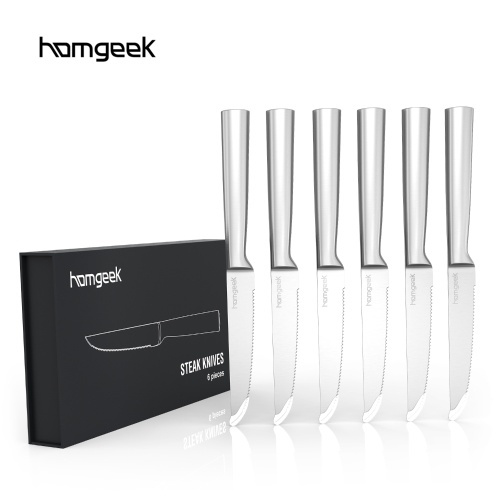 Complete Dinner Set: Includes 6 pieces steak knife, each cutlery set is perfect for dinner parties, family meals and pizza nights with friends. Comes in an appealing box, makes a wonderful gift for anniversaries, birthdays, weddings and more. 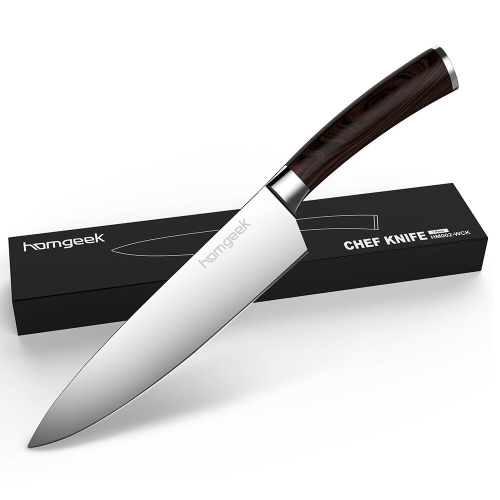 It is provide a polished finish for the modern home. 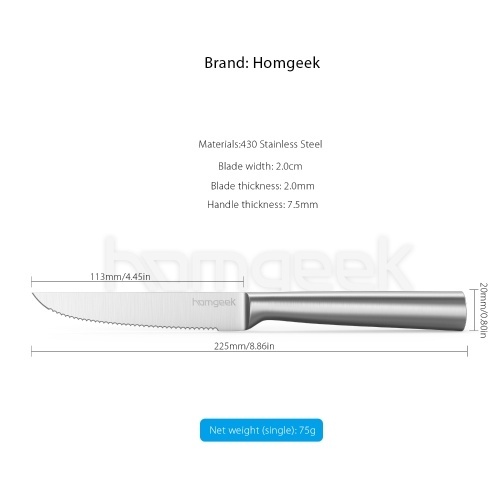 The handles don't show fingerprints like mirror-polished cutlery does and will clean up nicely. 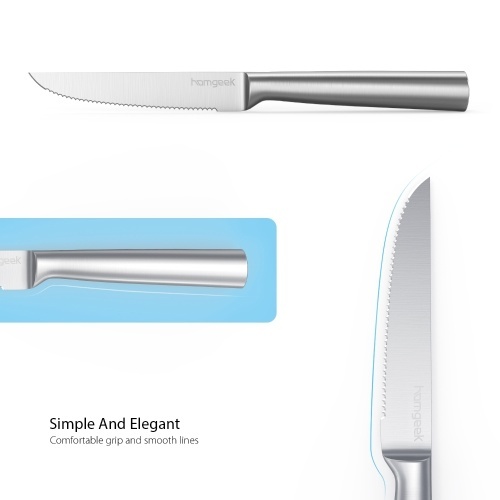 With its help, you can cut the delicious steak easily and elegantly. 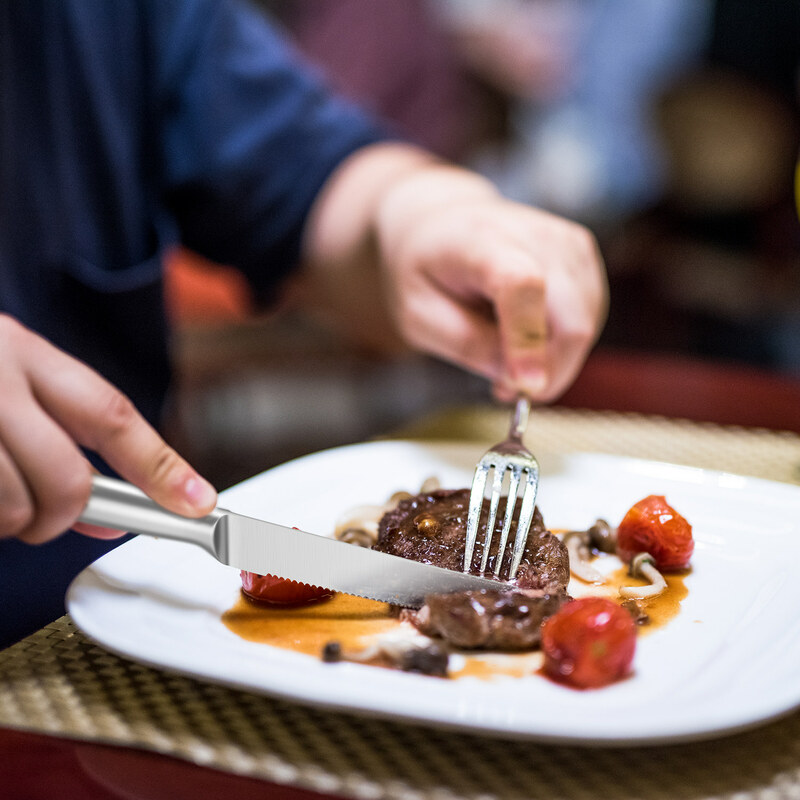 We are sure the guests will be impressed by such an enjoyable dinner with you. 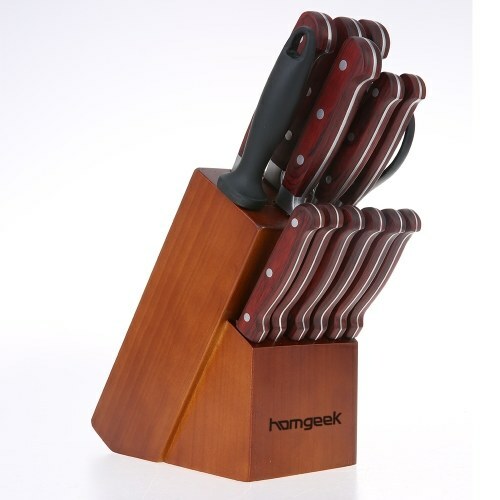 These steak knives are designed with a small, sharp, single-sided serrated edge. The serrated steak knife blades were crafted to perfection with an 18-degree blade slope. Each serration point on this steak knife set is carefully spaced to maximize edge longevity against hard surfaces like dinner plates yet provide a buttery smooth cut. 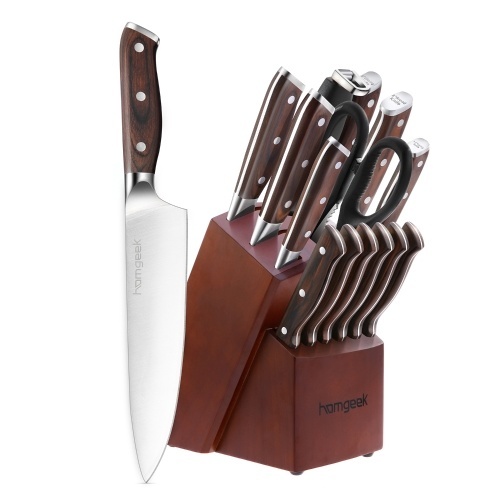 Our steak knives won't need to be sharpened and will last for years to come. Perfectly balance, each knife is ergonomically designed and in style with easy grip handles, allows for right or left handed usage. 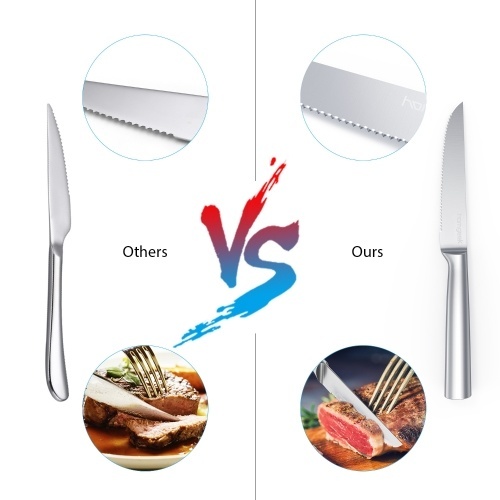 Seamless construction, which adds a touch of elegance as the blade and handle are cut from a single sheet of steel, eliminates food and dirt traps. 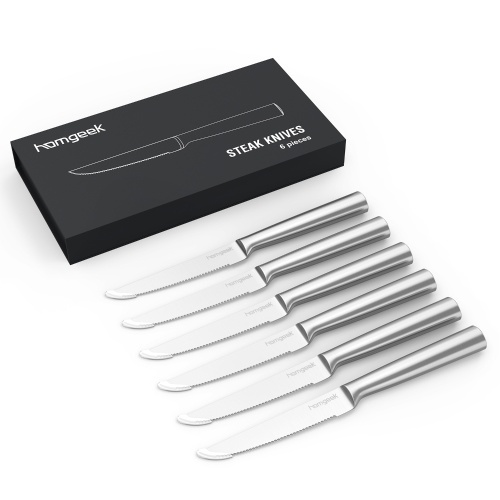 Our steak knives will ensure that you cut through your steak, Chicken, and grills with ease and you'll find the meal more easy and enjoyable using these steak knives. 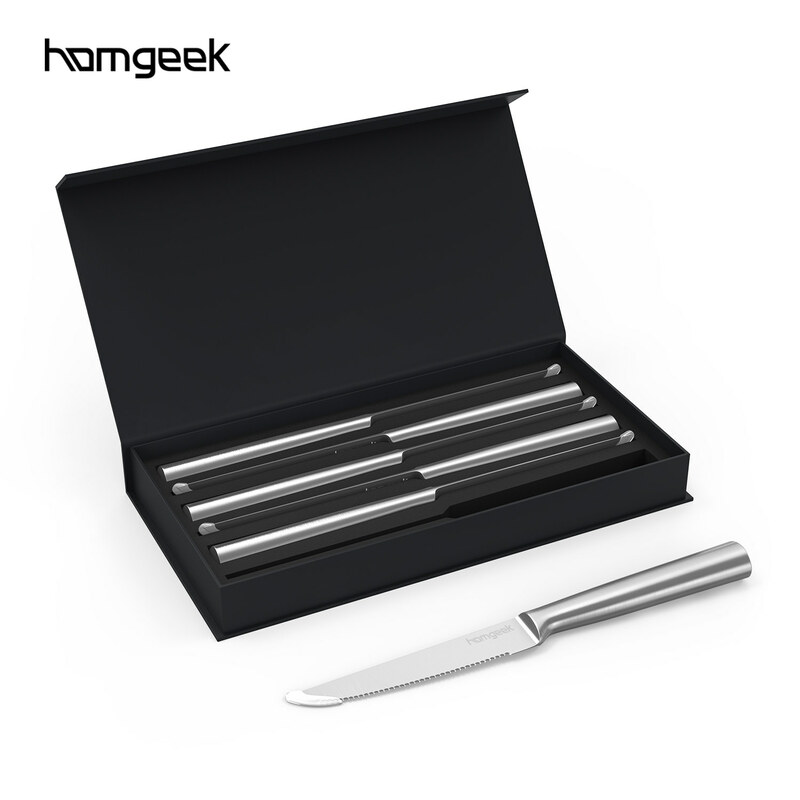 This steak knife set comes within an appealing box, with a form-fitted insert holding the knives in place. 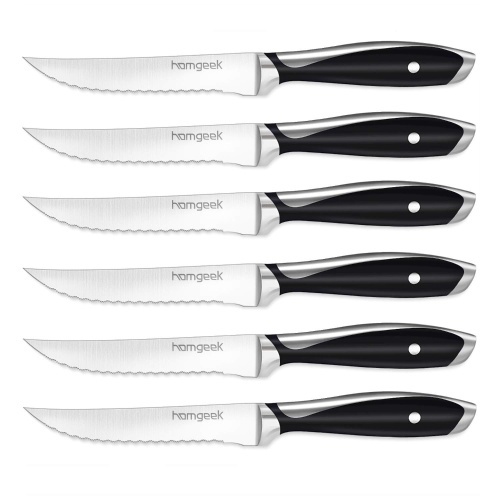 It’s the perfect gift for anniversaries, birthdays, weddings and more. 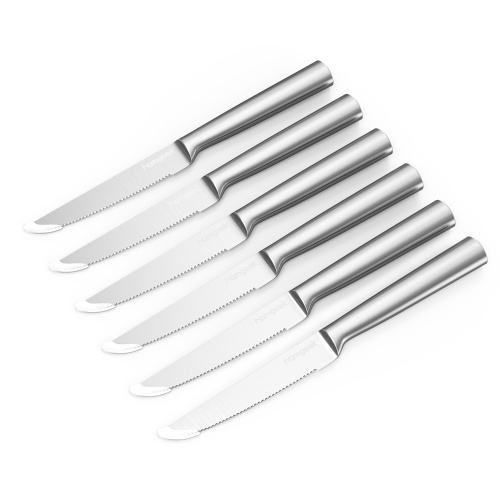 These kitchen knives should not be washed in the dishwasher. Handwashing is recommended. 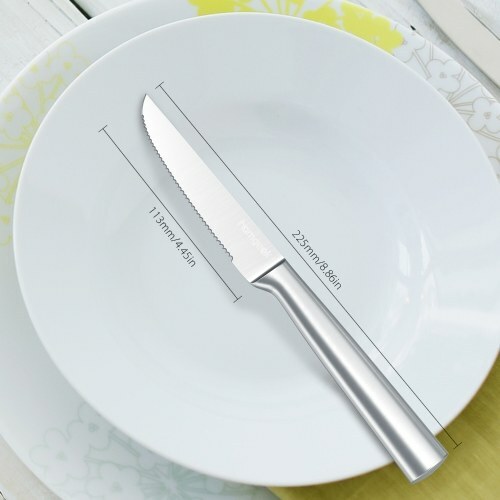 In the dishwasher, blades can knock against one another, reducing the longevity of the edge.